If possible, orient your cold-frame to the south, with the top angled about 25% to 30% from front to back. If that isn’t possible, at least make sure your cold-frame is in a sunny spot. And angle the top enough for rain to run off. If you garden in an area with severe northern exposure (such as in Alaska), you’ll need to angle your cold-frame a bit more steeply because of the sharp angle of the sun during spring and fall at those longitudes. What can you grow in your cold-frame? Anything you grow in your garden: In many areas, you can sow seeds of spinach,lettuce, kale, choy, and other salad greens in fall to enjoy in winter. Or, transplant heads of lettuce, cabbage, and cauliflower inside the frame. Consider transplanting a short pepper plant or two for extended production through another month or two. 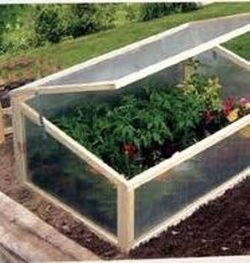 In areas with an extra-short growing season, a cold-frame may be the only way to grow warm-weather crops. High-altitude gardeners and Alaskans use cold-frames through summer to raise tomatoes, green beans, and cucumbers. (Lynn Byczynski is the editor of Growing for Market and the publisher of The Hoophouse Handbook). the seeds will sit dormant over the winter. But, when conditions are right, they will come to life and grow rapidly. Overwintered veggies can be several weeks to months ahead of spring-sown crops. it's possible to harvest spinach all winter. Cold makes spinach incredibly sweet and succulent. The best varieties for winter production are 'Tyee', 'Red Cardinal', and 'Python'. beets, carrots, lettuce, onions, peas, and scallions. Always look for the most cold-hardy varieties of each crop. Direct seed in fall and watch them to determine whether they germinate then or in late winter. If they germ-inate and grow quickly, they may be killed by winter cold; in that case, seed later next year. 1. In a high tunnel, direct seed spinach, lettuce, and greens as soon as day length exceeds 10 hours (January in the South, February in the North.) Cover the beds with row cover on hoops for extra frost protection. If you don't have a high tunnel, make a low tunnel of hoops covered with greenhouse poly and plant spinach, Asian greens, mache, and onions as soon as the soil can be worked. transplant them to a low tunnel covered with greenhouse poly or row cover. Using a dibble, make holes about 6 to 8 inches deep, six inches apart, and drop in the leek plants. Don't firm the soil, but let rain or irrigation wash into the dibble holes. 3. Keep a wide piece of heavy row cover on hand in case of early frosts on unprotected crops. A single piece can be pulled over multiple beds quickly. Once the crop has been harvested, roll or fold the row cover, put it in a plastic bag with a drawstring, and hang from rafters to keep mice out. 4. In the hoophouse, plant spinach and carrots to harvest all winter. Spinach will keep growing even in the short days of winter, so the young leaves can be picked repeatedly. Carrots will grow to maturity in fall, but can be left in the ground to harvest as needed. Both will be crisp and sweet from the cold weather. growth. They will resume growth in late winter and be a month earlier than spring-sown spinach. **Insulate Tender Plants: A 6-inch blanket of leaves protects tender plants from winter wind and cold. Cover cold-hardy vegetables*such as carrots, kale, leeks and beets*and you'll be able to harvest them all winter. **Boost Your Compost Pile: Carbon-rich leaves balance high-nitrogen compost ingredients such as fresh grass clippings. **Improve Your Soil: Mix shredded leaves right into your garden. Next spring, your soil will be teeming with earthworms and other beneficial organisms. **Make "Leaf Mold": Simply rake the leaves into a big pile. If you shred them, they will decompose faster, but you can still make leaf mold without shredding. After one to three years, fungus will have broken the leaves down to a special compost that smells like a walk through the woods. Leaf mold is high in calcium and magnesium and retains three to five times its weight in water - rivaling peat moss. Think Before You Shred. **Be careful with some kinds of leaves. Walnut, eucalyptus and camphor laurel leaves contain substances that inhibit plant growth. It's best to compost these leaves before using them in your garden. **If you add shredded leaves right to the soil, add some slow-release nitrogen fertilizers to help the leaves decompose and to ensure that soil microbes don't use all of the available nitrogen. aid in the joint discomfort from rheumatism, sores, eczema, bruises and wounds. is perfectly safe to use. Try freezing both the flowers and leaves for garnishing and cooking. Crush or mince the spiky leaves before sprinkling over or rubbing into foods. Remember, the frozen rosemary is stronger than fresh. There seems to be no end to the way rosemary can be used. Its piney scent can be added to soaps, creams, lotions, perfumes, toilet waters and sachets. watering a couple of times a week with a handful of ice cubes to keep it moist but not too wet. Try making a pesto of rosemary for seasoning a steak, chicken, lamb, or pork.